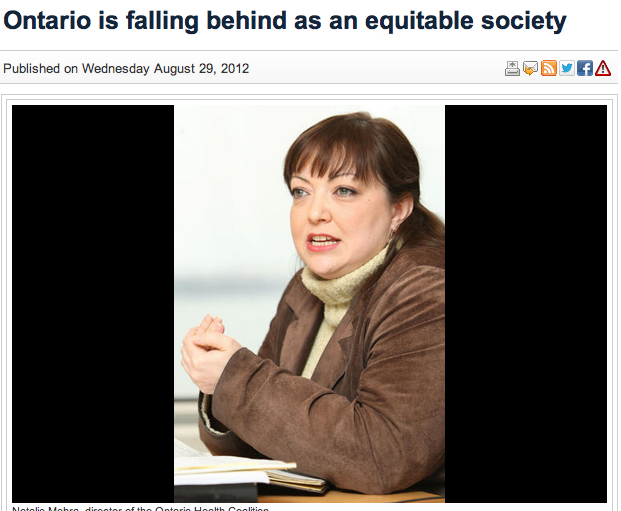 — On Thursday, August 30, 2012 the Toronto Star ran the top editorial carrying the message of the Ontario Common Front. We’re 10th out of 10. Ontario has dropped to last place in Canada in supporting its most vulnerable citizens, according to a new report by the Ontario Common Front, a coalition of community groups, immigrant organizations, unions, First Nations and students. The statistics in the Falling Behind report, released Wednesday, are not new. What is new is that the study zeroes in on Ontario and compares it to the nine other provinces. As the richest, most populous province Ontario ought to be a leader. It has a thriving financial sector, a highly educated workforce, the highest concentration of millionaires and the strongest tradition of caring for the poor and disabled. But today Ontario also has the fastest-growing gap between rich and poor, the lowest funding for social services and programs, the worst record of investing in affordable housing, the fewest hospital beds per capita and the highest university fees. And on income disparity and child poverty, only British Columbia does worse. We don’t do badly on every front. Our minimum wage remains one of the highest and our social assistance rates are higher than most. But when all of the indicators are taken into account, Ontario — long seen as the standard for Canada’s “just and equitable society” — is backsliding the fastest. As a result, provincial revenues have shrunk by roughly $15 billion a year. The benefits have gone disproportionately to the wealthy who don’t rely on provincial social services. The price has been paid chiefly by the poor who have been forced to tighten their belts. The Ontario Common Front is by no means the first to sound the alarm. The Occupy Movement last fall forced citizens and policy-makers to look at the top-heavy distribution of income in Canada. But by spring, it was superseded by a new round of deficit-cutting. Social activists, academics and a few think-tanks such as the Conference Board have been urging policy-makers to address the widening rich-poor gap for years. But their entreaties were ignored. The coalition identifies more than $12 billion in potential revenue-generation. For example policy-makers could restore corporate taxes to their 2009 level of 14 per cent from 11.5 per cent. They could make the 2 per cent surtax on high income earners permanent while lowering the threshold from $500,000 to $300,000. And they could eliminate tax preferences for stock options and capital gains. The real value of the report, however, is that it holds up a mirror to Ontarians and shows us what lies ahead if we continue on this course.